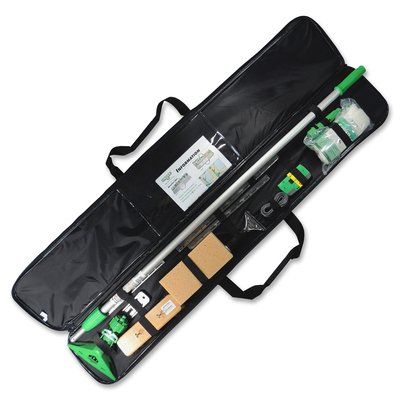 Professional Window-Cleaning Kit Includes The Tools You Need For Professional Window Cleaning. Ergonomically Designed Washers, Squeegees And Scrapers Fit Securely On The Extension Pole For Efficient, Safe Cleaning. Strip Pac Is A Standard Washer Sleeve With Plush, Woven, Synthetic Fabric For Maximum Cleaning Efficiency. The Squeegee Handle Features A Nonslip Rubber Grip That'S Perfect For All Weather Conditions. The Stainless Steel Construction Is Strong, Long-Lasting And Rust-Free..
Professional Window-Cleaning Kit Includes The Tools You Need For Professional Window Cleaning. Ergonomically Designed Washers, Squeegees And Scrapers Fit Securely On The Extension Pole For Efficient, Safe Cleaning. Strip Pac Is A Standard Washer Sleeve With Plush, Woven, Synthetic Fabric For Maximum Cleaning Efficiency. The Squeegee Handle Features A Nonslip Rubber Grip That'S Perfect For All Weather Conditions. The Stainless Steel Construction Is Strong, Long-Lasting And Rust-Free.